This is a funny design for birders. 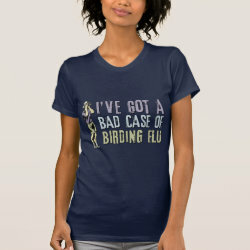 The grungy text reads "I've Got A Bad Case Of Birding Flu." For some, that is serious. Much worse than a simple case of bird flu. Warn others even if you're too late to save yourself. Birding is contagious, after all!